This incredulous question strikes at the heart of Gods Like Us, a deep resonating expression of the complete disconnect between the priorities of two men from very different backgrounds. The undercurrents of racial divide and tension, especially when seen through the lens of 2018, makes this at times a revolting exposure of race relations in 1918. 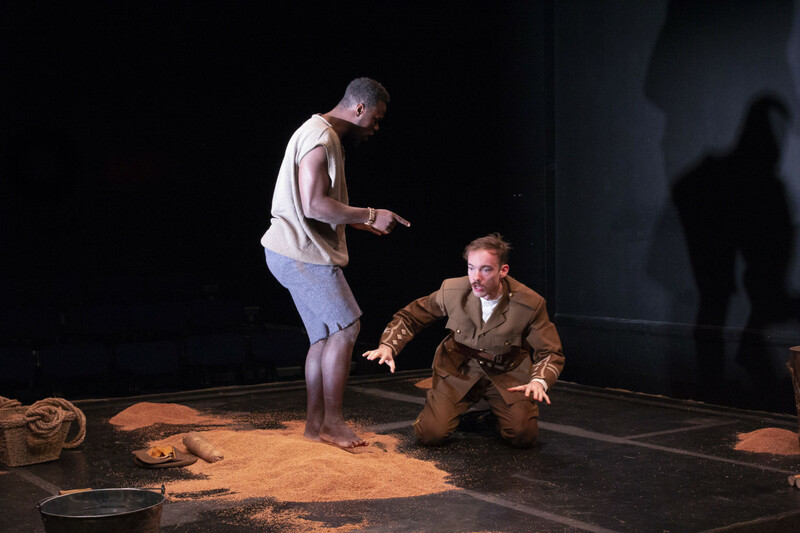 Zazu Oke plays a Nigerian farmer, freshly grieving the loss of loved ones as a result of the turmoil caused by British and French occupation as they try to drive Germany out of East Africa. His would-be recruiter, played by Vince Deiulis, strikes an imposing figure in his officer’s uniform — but he, too, suffers PTSD (or Soldier’s Heart, as he calls it) as a result of WW1. Spectres of enemies, imagined gunfire and the horrors of what he has seen plague him even as he tries to confer the benefits of joining forces with the Allies to a simply dressed yam farmer. Though the audience was sparse, it sat with rapt attention to the interplay of wills – one man, wishing to be left alone to live simply and by the teachings of his ancestors, and another sent by superiors he’ll likely never meet, to recruit others to fight a war he didn’t start. This small peek into two men’s experiences make up the tiniest fraction of said lives, but it is an interesting take on Dr. Akinjide Osuntokun’s publication “Nigeria in the First World War”, which provides much of the factual basis for the play and is well worth reading to interested parties. Zazu Oke’s talent shines in this work. His ability to convey emotion is deeply moving and unrelenting throughout the whole play; he commands the stage with his presence. His character delivers some of the best and most hard-hitting lines. In particular, after witnessing one of the Recruiter’s ‘soldier’s heart’ episodes, he pointedly asks if this haunted existence is the fate the recruiter wants him to have, and his tone conveys all of the doubt one could regarding the dubious offer of a better and more meaningful life with the Allied forces. Vince Deiulis is a good match in energy, especially during the Recruiter’s flashback episodes. The fear in his eyes as he stares at the creations of his traumatised brain feels real enough to touch. His character truly believes that he is fighting a good fight, the Good Fight, borne of misguided ideas of honour and duty. To this end, he uses many different methods to try and rope in the farmer: first, with money, then with the unintentionally insulting ideas of gaining respect and being “like us,” implying the advanced status of himself and his white brethren. Both of these are spurned by the farmer, who is socially aware enough to know the truth behind these misleading promises. As the divide between the two men grows, it becomes very clear that they will never see eye to eye, and furthermore, that bargaining will get the Recruiter nowhere. Heavy, well-paced with some wicked one-liners about the follies of war and men, and sprinkled throughout with Nigerian folklore, Gods Like Us culminates in a wrestling match — a physical scuffle that represents what happens when one man’s need for freedom clashes with another’s chosen life as a cog in the machinations of war. This Theatre Nidana production has been released on the 100 year anniversary of the armistice of the first world war as a reminder of countless lives lost. It’s a striking play on colonialism, war, and race relations that is well worth witnessing, and deserving of a much bigger audience than the one present on the 9th.